There are many little nuances and rituals in wine and sometimes these can get in the way of our enjoyment. The restaurant experience offers several, plus a myriad of legal issues that can cause some undue stress. For some it begins the moment the wine list is put on the table. Wine is full of questions: Color, year, bottle or by the glass and of course, price. A good restaurant will have a staff that can answer questions, the best will also have a current list on their website so research can be done before arriving at the restaurant. After the wine is chosen the rituals begin. First make sure the staff presents the wine label and it is what you ordered. 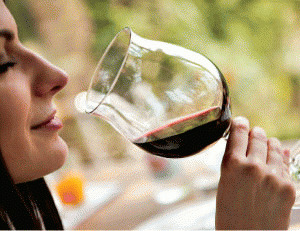 Then, taste and agree that the wine is not oxidized or “corked.” An oxidized wine has either been stored poorly or is too old which can lend the wine a vinegar-like aroma. A “corked” wine has been contaminated by a bad cork and the wine will smell like a damp, dank cellar or wet cardboard. While the tasting process is happening the wine waiter or sommelier often will put the cork on the table or plate for inspection. This ritual is all about fraud protection, but that is only for very expensive and collectible wines. Once you’ve determined the cork matches the wine, have the staff take it away, no smelling it, rubbing it, licking it or squeezing it. Just leave it alone and enjoy your wine. Next on the list is whether or not you can take your unfinished wine with you. Thanks to a recent law change it is allowed, but the wine must have at least one glass consumed at the restaurant and the wine must be sealed in a special bag with a staple and receipt to prove to the police who pull you over that you weren’t drinking that ’82 Latour while driving. Don’t confuse all these cork rituals with the term corkage, which refers to the concept of bringing your own wine to a restaurant and paying a small fee for that privilege. The key here is to be respectful, don’t spring a bottle on a restaurant, call ahead and don’t bring something that isn’t special, also make sure that your tip includes what the wine might have added to the final bill.